According to latest reports Nissan will be building an even more potent version of the GT-R but it won’t arrive until 2009, one year after the super-coupe is launched in most markets. The new model will carry the familiar V-Spec title, a badge used by the older R32-R34 series cars to denote the GT-R’s racing success as well as some serious performance enhancements. 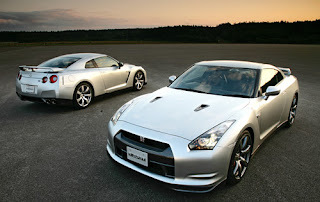 A Nissan source has revealed to Edmunds that a V-spec version of the all-new GT-R will arrive in 2009 as a 2010 model. The new car is still under development but when it arrives it will be more powerful and lighter than the standard version, which suggest the rumored 7m 38s Nurburgring time could fall further. Previous V-spec cars featured an improved brake package, lowered suspension, and plenty of carbon-fiber and aluminum. The latest GT-R series was also rumored to feature a high-performance ‘EVO’ model that was tipped to weigh up to 250kg less than the standard car and develop up to 530hp.